A tropical seafront paradise nestled along the serene coastlines of Western Mexico. Located in the eco friendly village of Troncones, a three mile secluded beach, just 30 miles northwest of Ixtapa/Zihuantanejo, this jewel at the water's edge combines the luxury and comfort of a resort with the barefoot tranquility and authentic charm of exotic traditional Mexico. Step into paradise and discover this jewel for yourself. Please note the standard rate is for a one room only rental! Perfect for a couple. 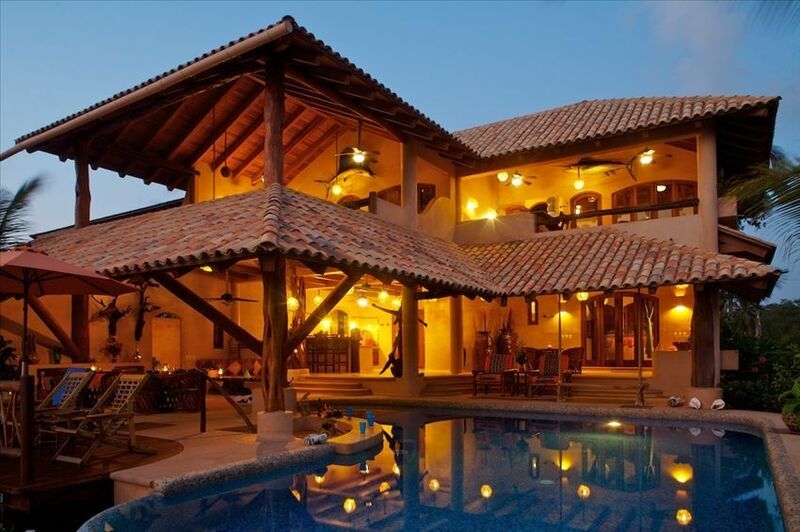 Villa Festiva is a new private beach front hideaway designed for any tropical adventure. 360 degree views of the sandy beach and the lush Sierra Madre mountains make it a perfect place to unwind and enjoy relaxed beach living with a magical blend of romance, privacy and luxurious comfort. The villa is hugged on all sides by lush gardens of tropical foliage. A yoga platform/sundeck lines the front of the property directly facing the ocean. Take a swim in the beach entry infinity pool, enjoy a margarita while you watch whales migrate past from your breathtaking ocean view balcony, enjoy spectacular sunset views. Relax in the refreshing ocean breezes. Troncones is a beach like no other. Home to warm friendly people, world class surfing, fishing and beaded golden sunsets. Villa Festiva (Festive House) is a new property. Villa Festiva is located right in the sand in front of the best swimming beach in Troncones! View of the beautiful Sierra Madre mountains directly behind the property. Lay in bed, sit on the couch, or take a shower. The ocean is visible whatever you're doing. No rocks. Perfect for swimming, surfing, or boogie boarding. Telephone on property for local calls only. Please check with your cell phone provider before departure for a Mexico plan. Bring your computer and sign on! (3) Three full size kitchens with all amenities. Full size refrigerators in each. All kitchens are open air with a private table for each. Two upstairs rooms have balcony overlooking the ocean. Each room has their own private individual balcony and/or patio area. Complete with dining table and sitting area/couch for the ultimate in privacy and romance. Smoking is not permitted at any time in the bedroom/bathroom or any enclosed area on the property, but is permitted in the outdoor/patio areas. Villa Festiva (Festive House) is a new property. The Villa has three king size suites. Each room is private and luxurious! All with full size kitchens, microwaves, stoves, and full size refrigerators. BBQ grill with sink burner and preparation area. Fully furnished with beautiful accessories. A yoga platform on the front of the property looking directly at the ocean. This can also double as a sun deck. Three beach palapas and another yoga deck in front of the house in the sand will be added soon. Daily maid service and a Gardner/pool person is included. Property management close by to answer your questions. Cook and/or bartender can be arranged when requested. Additional charges will apply. Massage, manicures/pedicures, mariachi band, etc. can all be arranged for your relaxation or your special event, whatever it may be. Clean, open layout, great pool, beach out front, and absolutely gorgeous view. Not much else to say. It was an amazing stay. My husband and I have been staying at this property since 2011. The property is beautiful and believe me when I say, the pictures cannot capture how breathtaking it truly is. We have fallen in love with the house as well as the town. This year, we introduced some friends to the property and they were blown away. As much as I'd like it to remain our little secret, I must share how incredibly awesome it is. The owner is a joy to work with. She is very attentive to your needs and will solve any issues immediately. The staff at the house is amazing as well. They make you feel comfortable and work hard to ensure the house is in perfect condition. They are so kind and courteous, it is a joy to visit with them each day. The location of the house is perfect. We do not rent a car, there are many restaurants and the center of town all within walking distance. We take taxis whenever we want to explore further than we can walk, pricing is very reasonable. We generally rent homes for all of our vacations, and this home is one of the nicest. It is well equipped with anything that you may need to enjoy your time in paradise. It is clean and comfortable. There are a variety of places to relax in and out of the sun. The pool and grounds are immaculately maintained and the rooms are comfortable and well kept. We highly recommend this property. Our trip to Trancones was an absolute dream. We were traveling with our 10 and 14 yr old daughters and were exceedingly happy with our stay at Villa Festiva and our trip to Trancones. Trancones offers a wide variety of great restaurants, exquisite beaches and friendly people. The kids spent most of their time in the pool and body surfing(wouldn't recommend this for young kids but our kids had a blast). We got massages and manicures on the deck, went on an eco tour, walked along the beach and generally relaxed. We did venture into Z town one day but scurried back to our oasis in Trancones. The house and grounds are beautiful, well maintained and kept very clean. Look no further, this place is sure to impress! I am actually sitting at one of the glass topped dining tables at Villa Festiva as I write this. I could not wait to write a review. This is my second time (5 years between visits) at this truly beautiful retreat and I am even more impressed with the Villa, the staff, the rooms, the beach, and the warm and wonderful Troncones Village! Since I was here last time, the main roads have been paved and there are more business nearby. Troncones seems to be growing up, and the people could not be lovelier. We are on a ladies trip and I'm watching two of my friends getting massages right down on the beach, aaahhh! The pool is cool and refreshing, very well maintained. The wood in this place is beautiful and the furnishing look new, still! The main kitchen downstairs is a dream to cook in, the range looks out over the ocean, don't burn your dinner, it's easy to get distracted by the beauty! If you don't care to cook, there are lots of restaurants in the village. I love the pizza at Cafe del Sol, and Manzanillo Bay Inn has an amazing menu and killer view while you indulge! Huge, healthy coconut palms line the property and the foliage is more lush and mature than last time we were here. The staff, Angel and his wife Lupita are adorable and very accommodating. They have been on the property for years and know how to take care of the Villa's guests. I am the early bird in our group, so make my coffee in the kitchen right outside on the upstairs balcony. It's a great way to wake up and start my day in paradise! One highlight I really love is releasing the baby leatherback turtles from the nearby turtle nursery. A conservation group collects them after they have been laid and incubates then in a protective pen about 100 yards up the beach until they hatch. Just visit Robertos Bistro and he can tell you when the next sunset beach release will happen. Such a special event! Jeanette, the owner, is a dream to work with and also very accommodating. She works closely with her property manager to make sure your needs are met and your stay is everything you dreamed of! There are a number of places to stay along this beautiful stretch of beach, but Villa Festiva is truly a jewel and I highly recommend it! Villa Festiva exceeded all our expectations and is the most beautiful vacation home we have ever stayed in without a doubt. The architecture and decor were amazing. The house and grounds were immaculate. No detail in comfort overlooked. Instant hot water, very comfortable bed. Full outdoor kitchen with BBQ. The infinity pool was perfect for floating around with a drink in hand! The sandy beach and warm ocean water a stone's throw from the home. Outdoor shower. Numerous beach restuarants within walking distance. One restuarant, Roberto's, was a 2 minute walk down the beach. Fabulous food. Friendly local people and a safe neighborhood. Given over-inflated reports on crime in Mexico, we asked an American who lives in Troncones about the area. He told us that Toncones is extremely safe. Said that a few years earlier, two young men tried to burglarize a shop and that the local townspeople ran them out of the area. Crime is not tolerated. We enjoyed our evenings wandering the pristine beach, watching the sunset, sipping a drink and talking with wonderful people at the local restaurants. We even got the opportunity to see the baby sea turtles released to the sea. Tronocones is like the old Mexico I used to know 20 years ago and the best place to experience the magic is at Villa Festiva. Cave tours, bird watching, whale watching. This destination is one of the worlds top fishing and surfing areas! Enjoy the best air and water temperatures all year round! Call for rates based on time of year high or low season. We look forward to having you as our special guests!